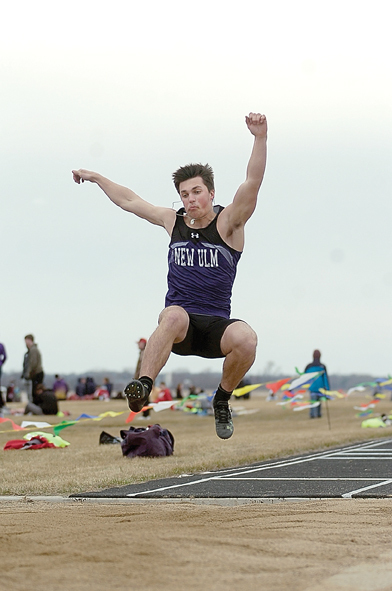 NEW ULM — The New Ulm High School boys’ and girls’ track and field teams hosted a home-opening meet with Mankato West, Minnesota Valley Lutheran and Fairmont on a windy Tuesday evening, with the Fairmont boys’ and girls’ team finishing first. 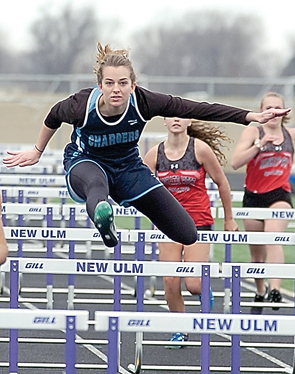 Much like last season, continuing to stand out for New Ulm was sophomore Paige Kalis, who tied for first in the 100-meter dash with a time of 13.28. 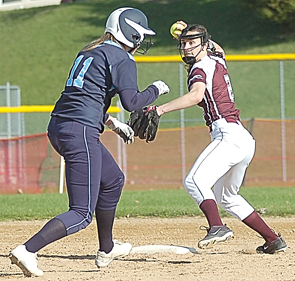 Kalis was proud of her time in the 100, especially after returning recently from an injury. 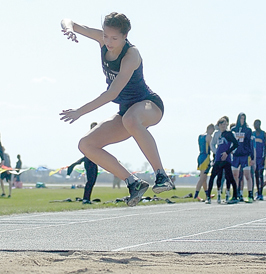 Kalis also said that she was glad to get the meet in before the incoming inclement weather hit and that she was glad to see Mankato West added to the meet. Kalis also took first in the 200 with a time of 27.21 and first in the long jump with a distance of 16 feet. For the New Ulm boys, Ben Mathiowetz finished first in the wheelchair shot put (11-8), and first in the wheelchair discus (20-10) while Jack Howard took third in the long jump (18-5) and fourth in the 200 (24.25). 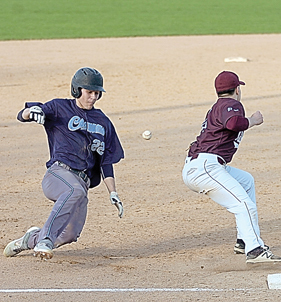 Also for the New Ulm boys, Sean Howk took second in the 400 (54.00) and third in the 100 (11.5). For the MVL girls, Sonja Rygh and Livia Reinarts were the two girls to tie Kalis in the 100 for first. The MVL girls also got a solid 1,600 finish by Abby Nelson, who was second with a time of 5:55.56. Abby Nelson also took first in the discus throw (90-9) and second in the 800 (2:40), while Kaylee Hunter took second in the triple jump with a distance of 32-feet, 7 inches. Clare Fischer took second in the 3,200 (13:35), while Mara Weisensel finished second in the 100-meter hurdles (17.4) and second in the high jump (4-10). Emma Nelson took third in the 300 hurdles (52.05) and second in the shot put (33-2). MVL’s 4×100 girls’ relay team consisting of Lexi Fosburgh, Kendra Lyimo, Anna Schwartz and Hannah Marzinske took first (55.03). For the MVL boys, Izayah Harrison continued to burn past other sprinters this season, finishing with a time of 11.15 in the 100. “Winning’s nice, but my time is definitely an improvement for my first meet outdoors,” Harrison said. Harrison also said that his early goals are honing in on his times and consistently reaching 11.3 in the 100 and 23 in the 200. Also for the MVL boys, Jake Kettner took second in the high jump (5-10).